I finished costume work in Door County and Guys and Does had a great opening. This morning I'm headed over to visit my gramma and then do some organizing and packing. 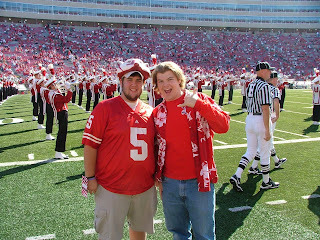 After that it's off to the Badger game with Ben. GO BUCKY! I was waiting to see this post and it was exciting that you have been telling me about the same things. These costumes are really good looking and you have done a great job. Workers on the costume projects can get enough guidance with read of your share in write describe personal experience. Hope you will share more words on australianreviewer.com here for your valuable visitors.